Japanese Episode AG 006: "Roketto-Dan Midare hikkaki de Sayounara"
American Episode 278: "A Poached Ego!" As Satoshi-tachi are checking out the nearest Pokemon Center, teaching Haruka about the various Joi and Junsa in the world, the Rocket-Dan continues to follow the group. As the trio watches the young trainers, they slip and fall into a part of the forest where a cage lies. Inside the cage is a bunch of Arbo, and Musashi's Arbok convinces the team to rescue them. The cage seems to be unbreakable, and before the cage can be opened the Pokemon Hunter Ryo enters the scene. Ryo is a famous Pokemon Hunter who has been hired to capture a bunch of poison-type pokemon, including a group of Dogasu he has in another cage. Seeing Musashi-tachi's efforts to free his latest captures, he demands that they hand over THEIR pokemon, but they won't hear it. After a battle in which Ryo's Sangirasu sends the trio blasting off, Ryo continues his hunt. Once the Rocket-Dan land, they are soon chased by a flock of Spear until a nearby Sabonea scares them away. Kojirou thanks the little cactus pokemon by giving it a bag of food before the group runs off to try to find Ryo again. They soon catch up to the Pokemon Hunter and another battle ensues. During the struggle, Nyasu is able to open the cage containing the Arbo and Dogasu as Musashi-tachi distract Ryo. Soon, the Sangirasu that Ryo sends out evolves into Bangirasu, and Musashi-tachi plead with their Arbok and Matadogasu to take the Arbo and Dogasu and flee to safety. As Musashi, Kojirou, and Nyasu fight off the Bangirasu without the aid of any pokemon, Arbok and Matadogasu tearfully do as they are told. After being defeated, the Rocket-Dan are left by Ryo as he tries to track down his freed pokemon. He doesn't get too far when Junsa, with the help of Satoshi-tachi, manage to stop Ryo and defeat him. As Junsa has Ryo arrested, Musashi-tachi sadly trudge along without two of their pokemon. Suddenly, the Sabonea from before appears and lets the Rocket-Dan know that it wants to join them, so Kojirou catches the Sabonea. Now, with their old friends gone and a new friend by their side, the Rocket-Dan continue their journey. Pocket Monsters Advanced Generation has been constantly trying to revamp the older series, having everyone start over, and this episode is more or less the last step of that process. While all the protagonists got to start over, the Rocket-Dan had to keep their old outfits, their old motto, and their old pokemon. Sure, their theme music is a little different in this series and Musashi's hair is a bit more on the purple side than it had been in the past, but overall they didn't get the new stuff that everybody else got. Well, that all changes after this episode. With this Rocket-Dan centered episode (which seems more like a pitch for a Rocket-Dan spin-off series more than anything else) the trio of Musashi, Kojirou, and Nyasu are forced to say goodbye to their longtime friends, all while Kojirou makes a new one. In addition, Satoshi-tachi's obligatory appearance wasn't a complete waste, as they actually got to learn about the various Junsa and Joi around the Houen region--if they had just done what The Simpsons do with their guest stars, I'd be pretty pissed. But I'm not going to get all fanboy on you and tell you that this is the best episode ever, because it just has too many flaws to earn that description. The fact that Ryo had only caught Arbo and Dogasu when there are plenty of other poison-types available (including those that could actually be found in the Houen region) just seemed like a cheap plot device to get Arbok and Matadogasu out of the show. And where was the clip montage for Matadogasu / Arbok? I mean, if a dying tree can get its own little montage and special vocal song, they could at least do the same for two of the show's longest lasting pokemon. First off--what's with the voices for all the poison-type pokemon? Ekans, Koffing, and Weezing all sounded terrible in this episode. It was similar to watching the first episode of Season Three of Dragon Ball Z, where we were subjected to Sean Schemmel trying his best to imitate Ian Corlett / Peter Kelamis, or Chris Sabat trying to imitate Brian Drummond's Vegeta. It didn't work for that show, and it doesn't work for this one either. If the voice actors were sick or something, then they should have changed the schedule around and worked on another episode until they got better, because this is the one episode where you DON'T have sound-alikes filling in for important characters. Secondly, Eric Stuart's James just sucked in this episode. I'm sorry, but there just isn't any nicer way to put it. I usually don't have any trouble with it since his goofy James voice works 99.99% of the time, but this episode was different because it was a more serious one. It's very rare for a Pocket Monsters episode to require any sort of realistic emoting, and unfortunately Mr. Stuart's performance this go around fell short in almost every way. Whenever James was supposed to be serious, Eric Stuart just gave him this ridiculous goofy tone that really didn't go well with the mood of the episode. It's that annoying tone used during the start of the motto ("We're Team Rocket, so make it double, jeepers creepers!") that seemed to prevail through every serious scene in the episode, and because of that my views on Eric Stuart went down a couple of notches. Rico: "Ah, you must be that same Arbok. You've saved me some trouble. Huh! Now don't you move!" In the Japanese version, during the part where Rico raised his gun and said "Huh!," we hear the gun being cocked. That sound effect is muted out of the dub. The sound came before Ryo's line of dialogue, but it was edited out of the dub. Rico: "These three are more trouble than they're worth. At least those pokemon are mine!" Originally, in between those two sentences, we can hear the gun being cocked. But not in the dub. While it seems like a pretty mild edit (I'm under no illusion that it's a huge deal), it doesn't bode well for Kimori's eventual Seed Machine Gun (Bullet Seed) attack. I mean, if they have issues with the sound of a gun getting ready to fire, does that mean that 4Kids plans to edit the sound of bullets being fired whenever the attack is used? During Bangirasu's attack on Musashi-tachi, we hear this really great piece of dramatic music that isn't used too often (I don't think it's ever been used in the dub, but it was last used during the flashback in the Japanese version of "Gotta Catch Ya Later" and isn't available on any soundtrack, as far as I know) while the sound effects from the battle are heard. In the dubbed version, 4Kids replaces the music with several different pieces (the original song is quite long) while getting rid of the sound effects altogether. So, why was this done? It's not like we haven't heard the sounds of explosions in the show before, so why the edit? The only thing I can think of is that maybe 4Kids thought it would sound better if they just played their music without the sound effects--y'know, in an effort to fool themselves into believing that they know the best way to score a scene. 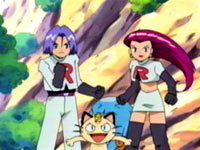 After the long attack sequence from Rico's Tyranitar, he recalls his pokemon and is about to leave Jessie, James, and Meowth. Suddenly, the three members of Team Rocket grab onto his legs and angrily tell him not to leave before collapsing at his feet. This is very different from the Japanese version, where Musashi-tachi's tone of voice wasn't the same at all. Originally, they sounded like they were barely conscious, as if it took all of their energy just to utter those last phrases before they fainted. But apparently the English actors couldn't get the "tired" voice right or something, so they instead just acted like this was just another "angry" scene. Which is really jarring and off-putting. Four seconds of the pan shot that occurs right after Kids' WB! 's final commercial break is cut. ...and it wouldn't be an episode of Pokémon Advanced if they didn't cut a few seconds from the TO BE CONTINUED screen.